​This 60-90-minute performance-documentary employs clips, interviews and “unplugged” performances to recall the explosive soundtrack of the Vietnam War era and its impact on the lives, attitudes and emotions of our fighting men and women. 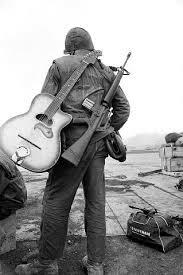 Soldiers embraced the hard-driving anthems of Jimi Hendrix, The Doors and Credence Clearwater Revival; protesters were roused by the anti-war songs of Bob Dylan, Joan Baez, Jefferson Airplane and Crosby, Stills, Nash and Young; and popular music itself was in the throes of a cultural revolution. The pulse of the nation was also powerfully expressed by soldiers who created their own vernacular battlefield music – some adapted from American folk traditions, some bitter and protesting, and some commandeered with wickedly satirical lyrics from pop hits of the time.